Our Triple Trust™ tracking system assures you that the identity of your pet is known at all times, and that you receive only their ashes. For more details on this proprietary tracking system, please call us at (724) 349-3310. All of our cremation services provide transportation of your pet from your home or veterinarian clinic to our Memorial Center for a small fee. 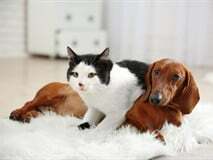 Your pet's cremated remains will be available, in a velvet bag, at our Center within 24 hours. All private cremations will be ready for the family to pick-up at Bowser-Minch within 24 hours. Veterinarian Clinic removals are available during business hours 9 AM- 5 PM for a fee of $50 (within a 10 mile radius of the Bowser Minich Pet Crematory). Removals beyond a 10 mile radius will be charged $3.00 per mile/one way. An additional fee of $50 will be added for after business hours or on the weekends. Home removals are available during business house 9 AM- 5 PM for a fee of $50 (within a 10 mile radius of the Bowser Minich Pet Crematory). Removals beyond a 10 mile radius will be charged $3.00 per mile/one way. An additional $50 will be added for after business hours or on weekends. An additional $50 fee will occur if it is deemed necessary to have additional staff to assist with removal. Additional urns, keepsakes, and jewelry are available. Call for more information. 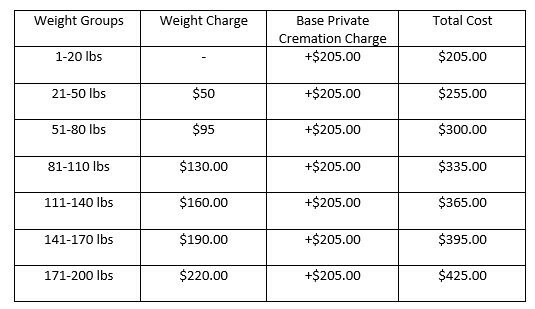 Please call Bowser Minich Pet Crematory at for more details on our Cremation Options, or stop by to tour our onsite cremation facility.